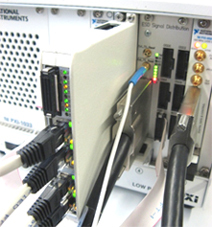 For recording of ethernet data traffic there exist solutions in software. If you want to verify the exact timing behaviour of an electronic control unit in the range of a few nanoseconds, you have to implement a hardware, which accesses the physical interfaces. FlexRIO-PXI devices from National Instruments have proven their capabilities to cover such applications. 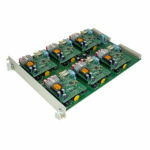 They can be integrated into customer’s existing PXI-systems easily. Furthermore the FPGA of the FlexRIO devices can process high data volume at high speed and they can stream data to disk at high rates. IRS developed a FlexRIO adapter module to test up to 4 Ethernet interfaces. Furthermore digital channels are available, where every transition may be logged with a timestamp. I.e. Ethernet frames may be correlated to digital switching events to examine the exact timing behaviour of the device under test. Both Ethernet frames and digital transitions may be streamed to disc including their respective time stamp. For offline-analysis, there is a software-tool available, to visualize the received data stream, examine errors and the respective timing.